This was undoubtedly an amazing encounter. However, it was also a dangerous encounter. A black bear that becomes comfortable with the presence of humans, and learns to associate humans with food, is a dangerous animal. Perhaps of greater importance (because you make your own choices about the risks you take) is the fact that such a bear is now at risk. If such habituation continues, the ultimate outcome will be that the bear will become, at a minimum, a serious nuisance, and possibly a danger to others, including cjhildren and pets. Such a bear must be trapped or sedated and then moved, or killed. We are not natural prey of the black bear, but they are incredibly strong, amazingly fast, and are wild animals with primal instincts – food, self defense, etc. Such a bear, in the wrong circumstances, can inflict terrible injuries even if motivated only by fear or a sense of danger. Thank you for your comments. Your opinions here show a mindset created over the years by persons basically motivated by fear. Most people are probably would agree with you having seen the same fear biased information you have. If you would like an education in the truth about Black Bear behavior the best place to visit, in person, or online, is the North American Bear Center here in Ely, Minnesota. Basically the Black Bear is an amazingly timid animal that has no desire to hurt humans and will work hard to stay away from humans. As you mention habituated bears can be a problem, but it is rarely the bears fault. My recommendation is, if you do not know how to act when in the presence of a Black Bear, don’t. 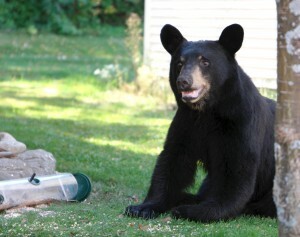 Visit the North American Bear center and learn from the experts what is and what is not good human behavior for human black bear interactions. But, no need to be afraid, just don’t be stupid.